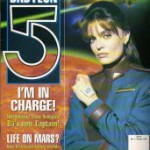 Remember that Babylon 5 collection that I’d mentioned on the show? The one published by the Science Fiction Foundation? My search for a copy of it yielded zero hits on eBay at the time, and the handful of copies available on Amazon.com were over $100, which was way more than I wanted to spend. But, interestingly enough, copies of it were available at Amazon.co.uk for less than half of that, including shipping to the US.